So you’ve been breastfeeding your baby and all is going well, but maybe now you’re wondering what the best approach is to ending breastfeeding. Are there any written rules? Things you should know? If you think that maybe it’s time for you to stop breastfeeding, then first consider these 10 benefits of allowing your child to self-wean. Nothing says that you have to quit nursing your baby at any given time. 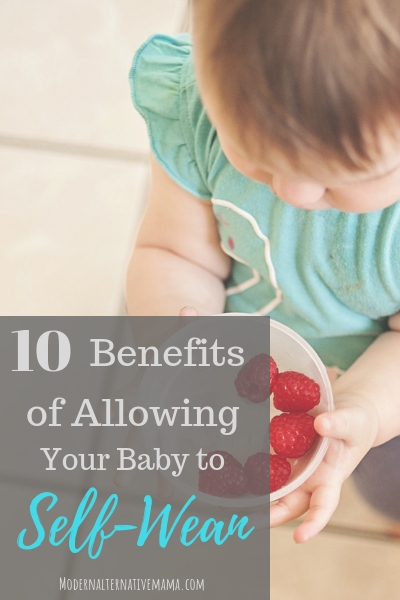 In fact, self-weaning may just be what’s best for you and your baby. But First, What is Baby-led Weaning? Nothing could be more gentle than allowing your child to self-wean. Before I knew the benefits of self weaning a baby, I was told by other well intending moms that I needed to be done nursing my baby at 12 months of age. So, I reluctantly stopped nursing him because I thought that was what was best for him. I still remember the tears and frustration we both had. There was nothing natural or gentle about peeling him away from me and sitting him down on the floor while he cried, not understanding why I wouldn’t nurse him anymore. Since then, I’ve learned much more about the benefits of allowing my child to self-wean. The next six babies I had have all been able to choose when to start eating solid foods in a natural sort of way. Then it just seems like one day we naturally and gradually stopped nursing and the babies started adding more solid food. Nobody felt bad about it. Both my baby and I were ready to go on to the next stage of life. Definitely much more gentle and natural! Likewise, your baby will know that she can still trust you and that you are still there to comfort her and nurse her when she needs it. As in the example of my oldest child, I felt like I was breaking a bond of trust with him. For a whole year he was able to gain all of his nutrition from me and also nurse whenever he needed comfort. Then suddenly one day it stopped. That’s definitely a breach of trust. However, when you allow your baby to explore food options, all the time knowing that she can come back to you for nourishment and comfort, you will continue to show her that you are trustworthy. If you continue to breastfeed your baby while she learns how to eat solid food, then you won’t have to worry that she’s not getting the proper amount of nutrition. You can think of nursing as a way to back-up her choices of food. 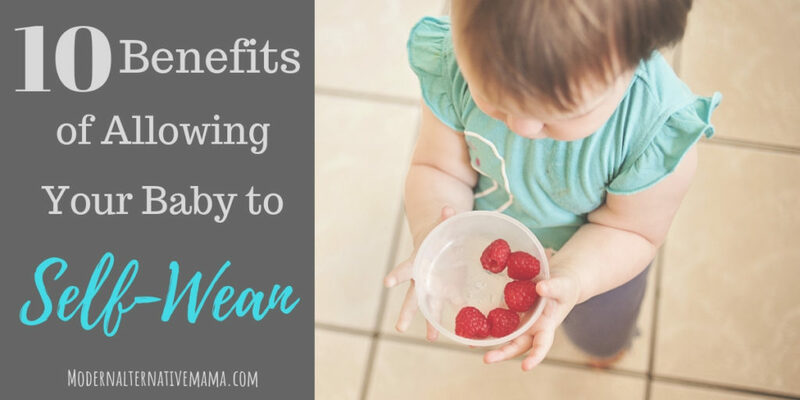 Self-weaning allows for your baby to experiment with food and discover her likes and dislikes, all while having the full benefits of the nutrition breast milk has to offer. Self-weaning allows your baby to choose the food she likes and ends the frustration of force-feeding your baby what you think she should eat. Now, this is not to say that you shouldn’t, as a parent, offer her a variety of healthy options of food. But when you allow your baby to self-wean, she will begin to explore the options she likes best. Of course, under the guidance of you, her loving parent. Since self-weaning involves letting your child eat real food that is broken up rather than food that has been pureed to an unidentifiable state, your baby will be able to actually try what real food should taste like. You may find she’s very interested in fresh peas, whereas, she might turn her nose up at peas in a jar. Everything your baby does is a chance to learn and grow. Food is no exception. When your baby learns how to eat real food, she is learning how to feed herself for the rest of her life. Not only that, but she will be learning other tastes, textures, colors, and so on. When a baby is allowed to self-wean, she has the opportunity to explore and learn all about the food around her. As your baby learns that feeding herself will satisfy a very basic human need, she will gain confidence. With each bite, she learns that she is able to fulfill a need for herself. When your baby learns how to feed herself, she will learn when she is hungry and when she is full. Since your baby is the one feeding herself, she will eat what she needs to feel satisfied. Far different from a baby who is made to eat a certain amount of food at any given meal. When your baby is allowed to feed herself, she won’t need to be bribed or tricked in order to eat. No hiding green beans under peaches! Instead, your baby will not need to be tricked into eating something she doesn’t like. One of my favorite parts of self-led weaning is that the baby becomes part of the family dinner table. Instead of your baby being an afterthought at the dinner table, she is a welcomed member of the family. As she learns to eat, she can experience the sights and sounds around her to help her learn all about eating. That’s a pretty awesome benefit of allowing your child to self-wean. Check out this post for tips for baby-led weaning. Did you allow your baby to self-wean? What benefits did you discovered?